Yes I am still alive and in Brisbane by now. About three weeks ago I met Simon, we picked Bella up from the airport a couple of days ago and now we are living in a beautiful house in Brisbane. We spend new years eve here and just enjoyed the time to relax in an own room and stuff. 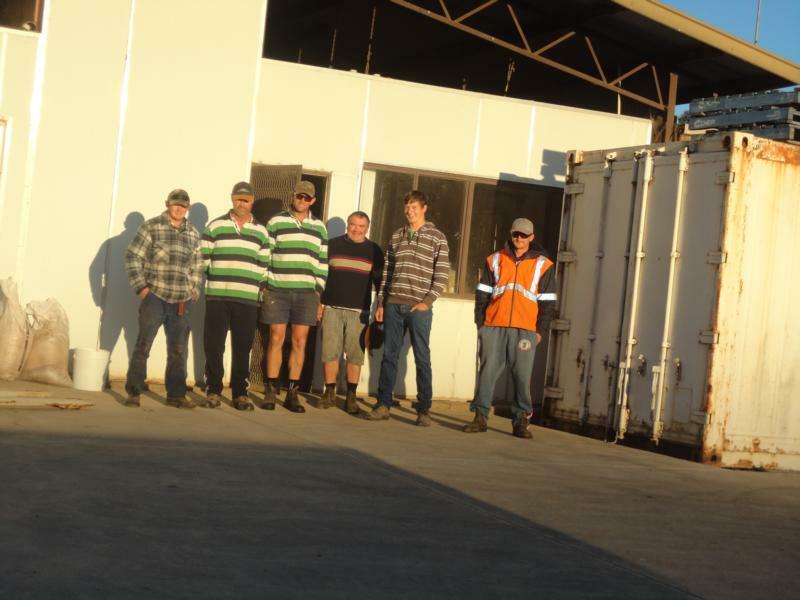 But before I started my journey up the east coast I had to leave Goulburn River Trout Farm. After about five weeks of living at Stuarts house I sayed good bye and we made that last picture with the "outside crew". I really had a good time at GRT and miss it now. It was good fun and good work there. 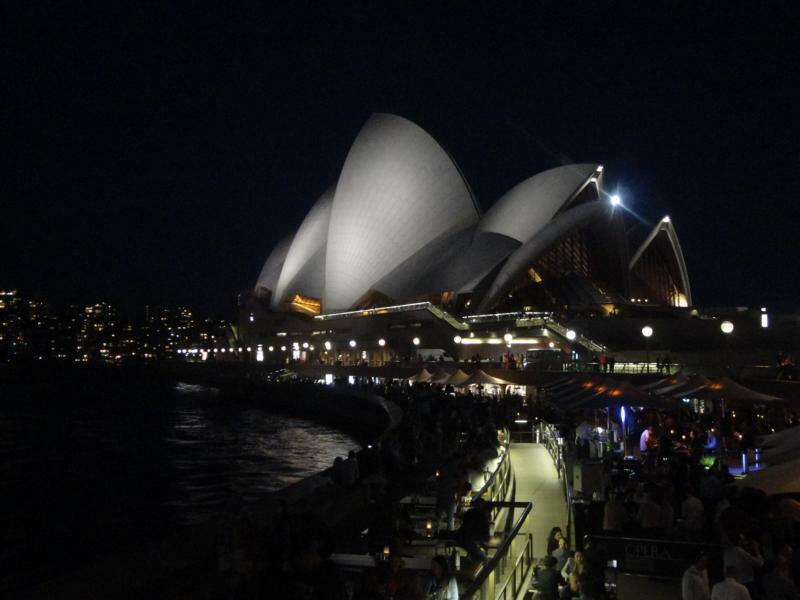 But besides sightseeing there was a lot of party in Sydney, too. 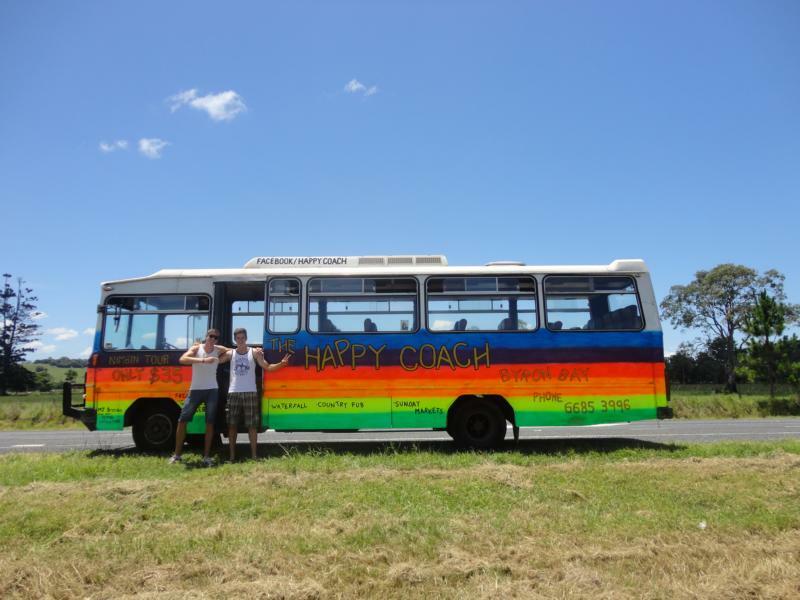 The biggest one I went to was a big festivel, the Stereosonic. The kind of music was not my favourite but it was really worth it to go there, to see the worlds most famous DJs. 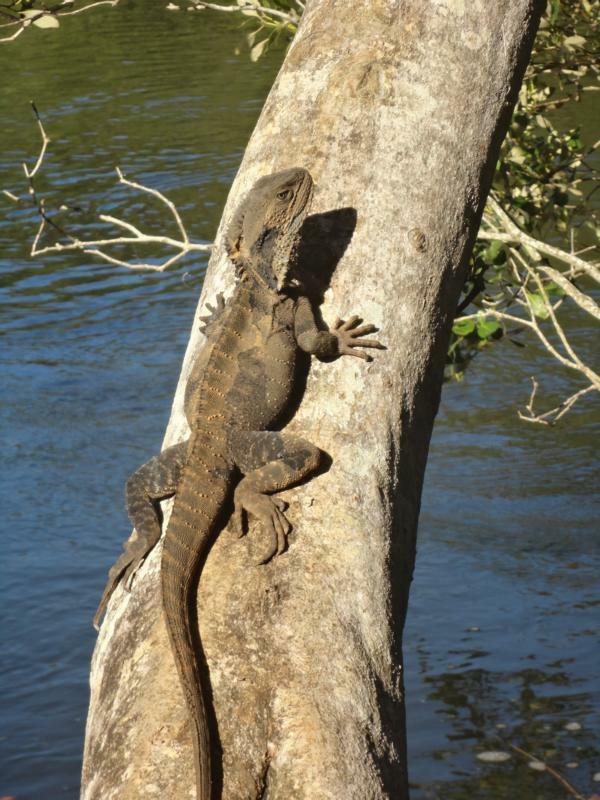 Beside the river in Port Macquarry I found that massive water dragon. It is always surprising what kind of animals appear all the time here in Australia! 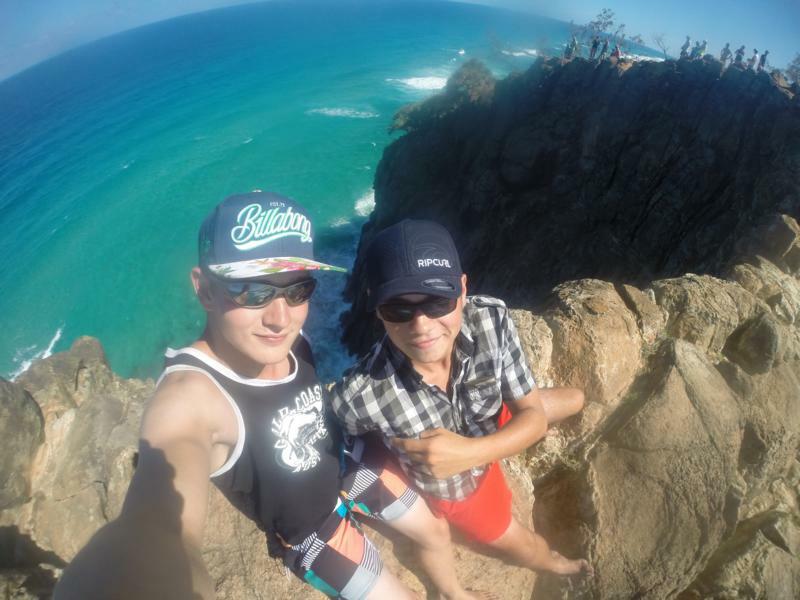 That day Markus and me went rock climbing again on the coast line of Port Macquarry. 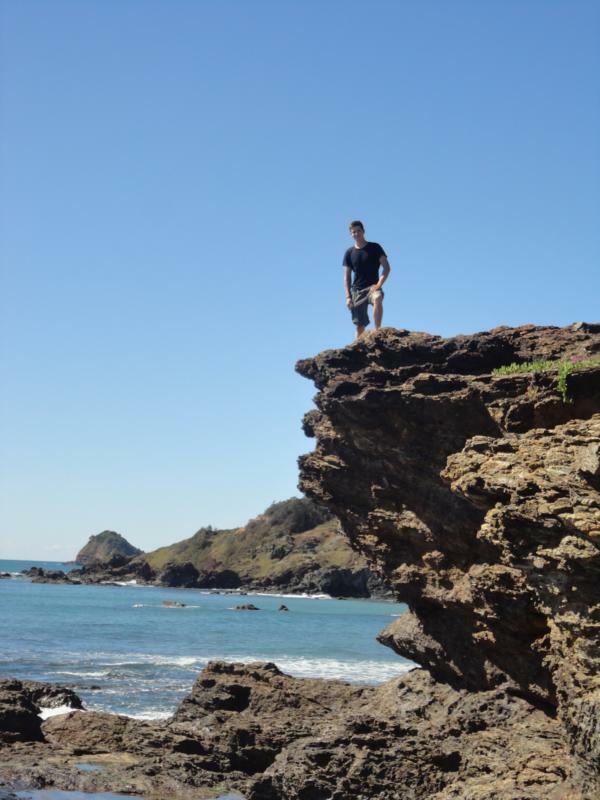 Good fun and just impressive big rocks right on those beautiful beaches! … and we also made a trip to „little Mattenbirdisland“ by kayak. That was pretty interesting cause on that island you can find naturals pools with big crabs in them. 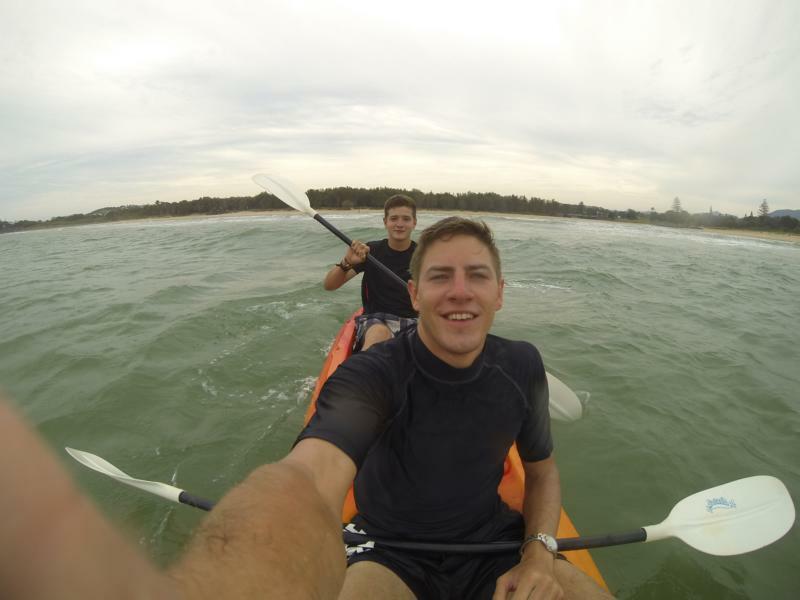 And besides that it is good fun to surf the waves with a kayak!! 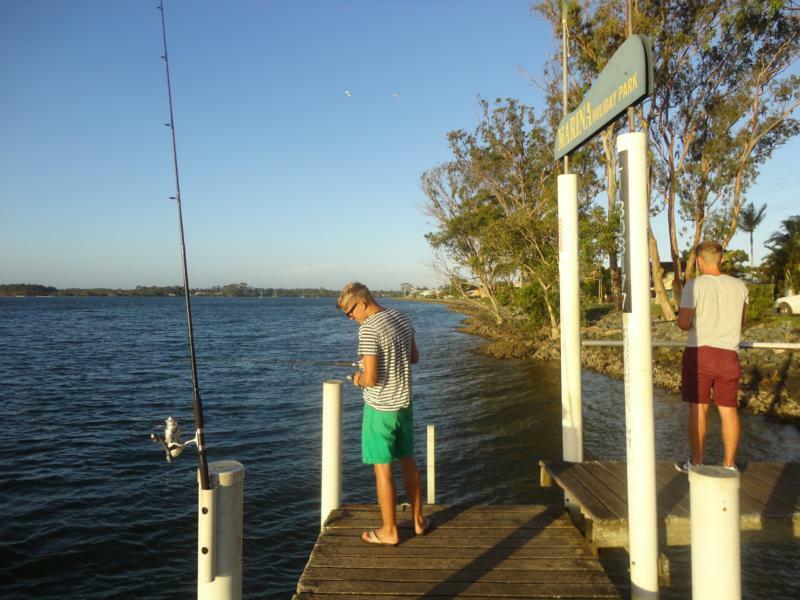 On the 15th of December Markus and I met Simon in Surfers Paradise, impressing waves there and good partys at night. I think we all really enjoyed our stay there! Here you see the end of the parade through the city centre to the beach. This city looked completely like new but way to big. 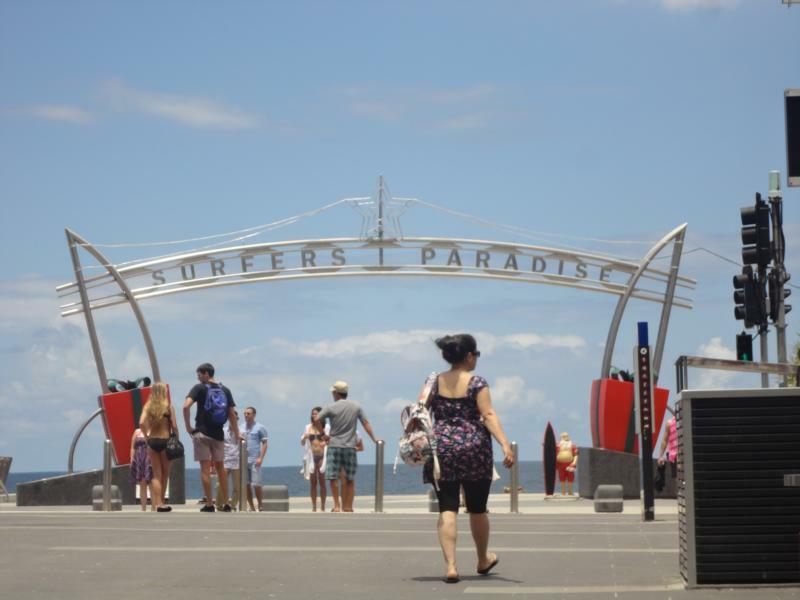 The whole Gold Coast is like one city and Sufers Paradise was just a small part of it. 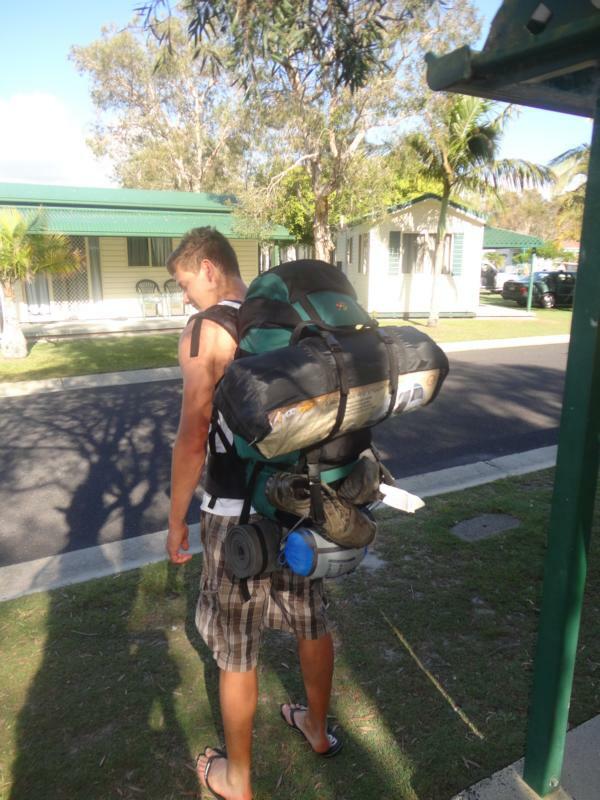 After that stay here Markus had to leave back to Sydney where his flight back to Austria departed. Simon and I really miss the times of travelling with him! 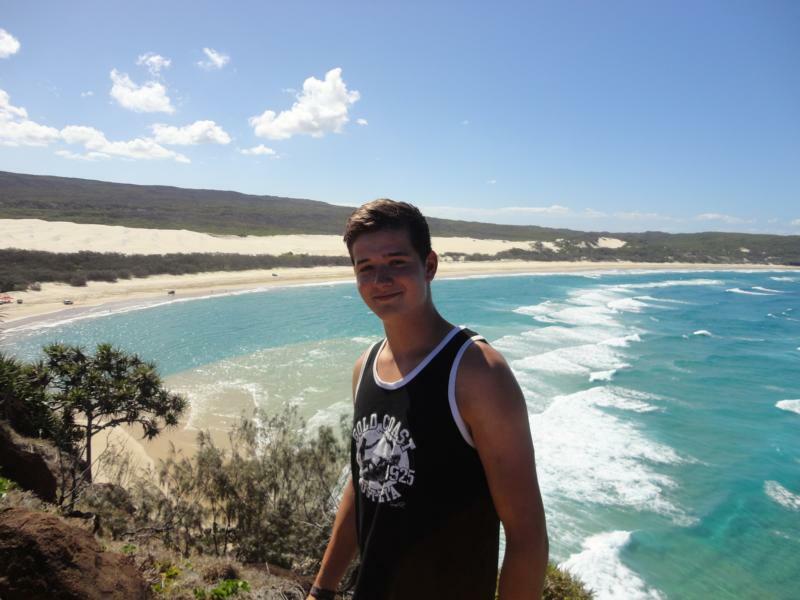 Then we headed up to Rainbow Beach - The town to travel to Fraser Island!! So after a night in the hostel there we took the ferry with our 4WDs and went to Fraser!! This is the whole crew we travelled with. Good fun with the 4WDs in the sand - including a couple of cases of getting stuck! But still we got everywhere we wanted to get to! For example the champain-pools, Lake McKenzie and of course our camp we stayed at and where we partyed! Can water be more clear nice and blue?! I don´t think so... Okay maybe on the Whit Sundays, but we will see! The sad thing was that it is totally forbidden to go for a swim in these water cause of big sharks, dangerous jellyfish and all these things... We were only allowed to enter the water in the freshwater lakes and creeks. All in all it was just stunning to see such a beautiful island! 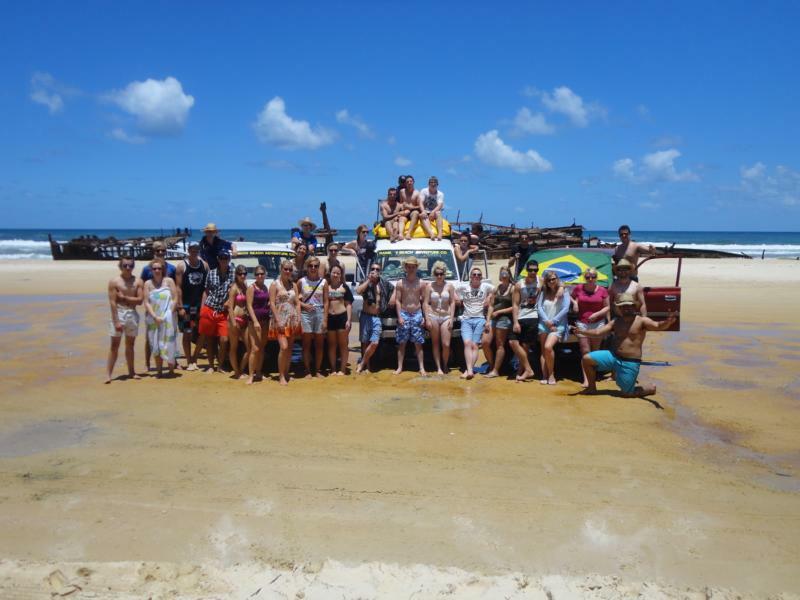 On the Fraser Island trip we got to know a couple of irish guys.. Pretty funny people after all and good drinkers! :-) One of theier girls names was Rosie so we named our red car after her. 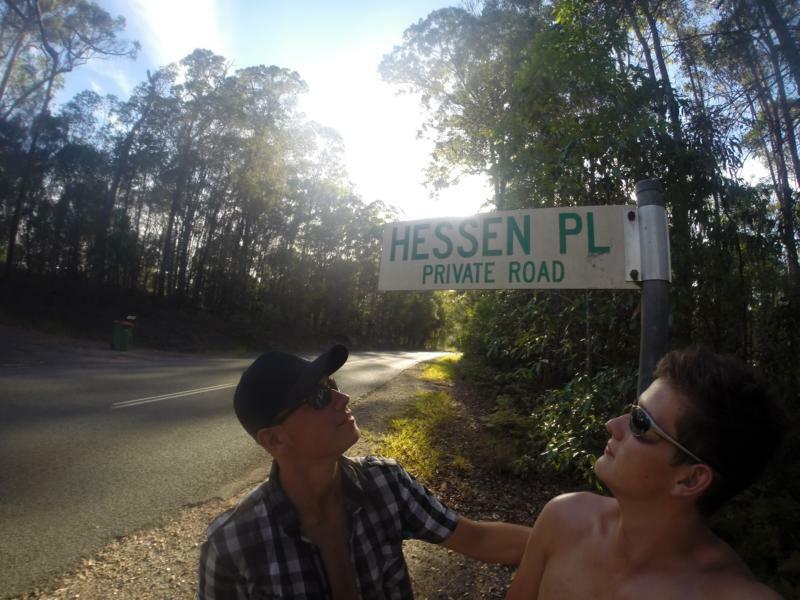 So we kept on travelling with "Rosie" and on a small countryroad we found a place called "HESSEN PLACE"! We couldn´t believe it, so we pulled over and took a couple of pictures. Finally it became NYE, Bella arrived and we stayed in our beautiful quiet house in Brisbane. 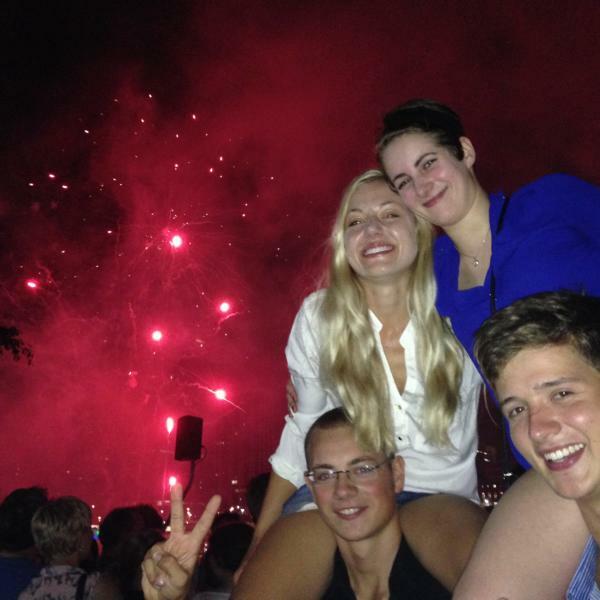 Nice party with beautiful fireworks down at Brisbane River! Since then we are still travelling up the east coast enjoing beaches and the nice weather... :-) More stories in January! !